Many of you will remember how my friend Mandy and I were diagnosed with cancer on the same day, hers was returning, however, for the second time. She previously had colon cancer and fought it, but it decided to make an appearance in her liver, spleen, and lungs. Gosh Dang It! She’s a fighter and also has a big heart. She wants nothing more for her 50th birthday than for random acts of kindness on her behalf. But, she also wants to party so she’s decided to raise money for colon cancer research. She put out a call for anyone to donate anything. So I made a blanket. I already had made her the modern mint throw but I wanted this one to be specific to the colon cancer community. I’m going to call it my cancer ribbon blanket because it can be made in any color for any cause. I made my ribbon gingham to recognize Mandy and the role she played in bringing the gingham pattern to the Daisy Farm. Here she is pictured with her beautiful granddaughter and the pink gingham blanket I made for her. So now let’s talk about the design process. I try to envision what it would look like and thought for sure the bigger checks would work out, however it didn’t go as well as I thought! It looked like an alien! I needed to start all over. I knew I needed the different colors to show up more to border the ribbon. There couldn’t be chunks of white on the edge. So I sketched a new pattern into my graph, and went to work again. Don’t you think this looks so much better? I decided that a thicker ribbing type border would be the best and chose the royal blue color since that stands for colon cancer. 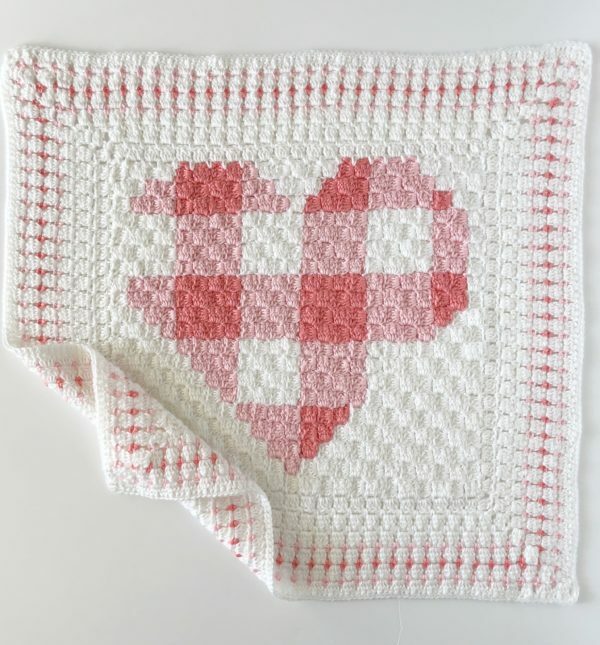 So a few skills you’ll need to have for this blanket is knowing corner to corner crochet. If you are a complete beginner at this type of crochet, I’m going to send you over to the crochetcrowd.com to learn from them. You need to be really comfortable following a graph and familiar with changing yarn colors. This is not hard to learn. And an easier start would be to make the ribbon one color. You don’t need to make this gingham. The other stitch you’ll need to learn is front post and back post double crochet. (fpdc, bpdc) Those are some handy stitches to know! I alternate them for the border and that’s how I get the ribbed look. You can take a peek at how I do that on my Instagram account. Look for a tiny arrow on the picture, or swipe over to see the video behind the picture. That should give you a good idea of what it looks like if you’ve never seen that before. The rest of the instructions for the border are in this video clip. I think it is much easier to show you what I did instead of write it out. This is the one time where I think the written out pattern for the border would make zero sense. It is much easier for me to show you so I posted a video to youtube. Here are all the materials I used for this blanket. The size turned out to be about 40 inches wide by about 50 inches long. It’s a small lap quilt size. 4 skeins of Caron Simply Soft in white, 3 in royal blue and 1 in soft blue. scissors and a tapestry needle to weave in all the ends. Now, before I go, I’d like to let you know about the foundation Mandy is supporting and hoping that they will be able to find a cure for her type of cancer. It’s called the WunderGlo Foundation. “I went in for an emergency hysterectomy in January 2015. Everything went great. I felt great after surgery but 3 days later I was in severe pain and was dehydrated. Scott, my husband, took me to the ER where they ordered a cat scan. They found a tumor in the corner of my colon. I had a colon resection a few days later. They took a foot of my colon, 24 lymph nodes and I was diagnosed with Stage 3 colon cancer. I went home, recuperated for 5 weeks and did some oncology shopping. I found the most amazing oncologist, Dr. Robin Obenchain and started chemo 5 weeks post-op. I completed 12 rounds of chemo and was cancer free! I didn’t have the “typical” symptoms you would expect with colon cancer. However, I now know that what I thought to be heartburn was actually pain caused by food that could not get past my tumor. I was suffering from bouts of constipation and then having the opposite of that. It was my body’s way of getting stuff past the tumor and not because of stress. About a year after chemo, all of the side effects from chemo were gone. I felt GREAT, better than I had ever felt in my adult life. I was doing 101 things, including planning on moving to China with my husband and our youngest son for a year in July of 2018. Life was good. My doctor said my scans, my blood work, and everything was fantastic. As a matter of fact, she said my blood was better than most people including those who have never been sick. In April 2017 she said that I could go down to yearly scans instead of every six months. I would still continue to have my blood checked every 3 months. When I went in at the end of October 2017, I told her I was concerned about insurance and what would happen next year when we were in China. She said let’s just go ahead and do the scan so you can have peace of mind. It took awhile to get approval from insurance for the scan. Finally, I got in for a scan in December 2017. It came back showing that I had a lesion on my liver that might be consistent with metastatic colon cancer. I also had 3 very small nodules on my lungs they were so small they probably couldn’t even be biopsied and seemed to be something that could be from a respiratory infection. After further testing and a liver biopsy it was confirmed, ironically, 3 years to the day on January 24th, 2018 that my cancer was back and had metastasized to my liver. I was SHOCKED because I felt great!!!! I had been cancer free for 2 1/2 years!! My doctor said I was a good candidate for a liver resection as it was supposedly a small lesion that we caught early. I went to the surgeon and asked how much of my liver he would have to take expecting he would say maybe 10% 20%, but he said he would have to take 60-70% of my liver! Apparently, the Lesion was in a bad place! He ordered a pet scan and referred me to another surgeon. After the 2nd surgeon read my pet scan he said that the spots on my lungs looked concerning and I should meet with a thoracic surgeon. I had an appointment with Dr.Abdo, my colon resection surgeon, who continued to follow me with semi-annual checkups. After reading my cat and pet scan he told me he was very sorry. It seemed to him that my cancer was aggressive. I was now showing 3 lesions on my liver. The spots on both lungs doubled and I had a new mass in the fatty tissue near my spleen. We are praying for a miracle for our dear friend Mandy. She is staying very positive and her outlook is full of hope, I’m honored to be able to call her my friend. And so honored to have designed this blanket for anyone who is going through the trial of cancer. Thank you for stopping by and good luck on your blanket. I prayed over every stitch on this one, and my hope is that this pattern will bring the miracle of healing to whoever needs it.